Great video on Air Force and Marine Forward Air Controllers in Vietnam, with O-1s, O-2s, and OV-10s. There is good gouge on the shadowy Raven FACs and the operation to recover Bat 21. The only thing missing is coverage of the Army’s O-1 operations. It’s long, so just bookmark this for later tonight. This is a marketing video. Most of the footage is from Vietnam, but there’s some developmental stuff in there as well. You’ve probably seen most of the clips, but I don’t think I’ve posted this particular video before. The Boeing 777X with have folding wings… but no tailhook. The easiest way to increase the load capacity of a jet is to increase the wing area. More lifties from the wing, more capacity. But that has drawbacks, such as more lifites also means more induced drag (though wing design can ameliorate this somewhat), and more complexity. There comes a point where wingspan increases not only become more challenging to build, but also impact existing infrastructure. The parking spots at the jetways at your existing airports are designed with a certain sized aircraft in mind, be it one with the 737 and A320 in mind, or for the 767, 777, and A330. Boeing is betting that the future of jumbo jets isn’t the A380 sized massive jet (and A380 and 747-8 sales appear to bear this out) but more along the lines of a larger variant of its existing 777 series. But to get the performance they need, they need a bigger, longer wing. But airlines don’t want to foot the bill to totally rebuild airport terminals to accommodate this new, larger wing. And so, Boeing will add a wing fold mechanism to the 777X, raising the outermost 12 feet of each tip, allowing it to use existing gates that can accommodate legacy 777 aircraft. Will some pilot somewhere sometime forget to put the wingtips down? I’m sure eventually someone will, though there is a take-off configuration warning system that will (quite loudly) protest if the pilot advances the throttles on the ground without the proper flaps/slats setting, among other parameters. Author XBradTC2Posted on September 8, 2015 Categories planesTags 777, 777X, boeing, planes4 Comments on The Boeing 777X with have folding wings… but no tailhook. Spill tipped me to this. The US Air Force has contracted with Draken to provide adversary support to F-35 operational testing at Edwards AFB. 8/27/2015 – EDWARDS AIR FORCE BASE, Calif. — A-4 Skyhawks have taken to the skies over Edwards in support of operational test of the F-35A for the Royal Netherlands Air Force. They are part of a tactics development and evaluation exercise initiated by the 323nd Test and Evaluation Squadron and supported by the Joint Strike Fighter Operational Test Team from Aug. 17-28. “Each service and each country has their own specific test events that they want to test for themselves, for their own service and their own country requirements,” said Rich Radvanyi, JOTT Planning Cell chief. The JOTT has five operational test squadrons composed of the 31st Test and Evaluation Squadron, the Marines’ VMX-22 squadron, the United Kingdom squadron 17(R), the Dutch 323nd Test and Evaluation Squadron and Navy squadron VX-9. Much as Lex worked with ATAC providing Kfir’s and Hunters to the Navy as contract adversary support, Draken offers jets as needed to the Air Force (and other customers). The Draken Skyhawks have an interesting history. Built as A-4Ks for the Royal New Zealand Air Force as a slight variant of the A-4F, they were later upgraded with the APG-66 radar (same as the F-16A) and avionics allowing the use of precision guided weapons. But in 2001, New Zealand decided they no longer needed jet combat aircraft, and retired their Skyhawk fleet. Having a good radar aboard allows the Draken Skyhawks to provide a sophisticated threat profile in exercises, beyond that of most other contract aircraft. Sixty-one years after Ed Heinemann’s Hot Rod first took to the skies, the Skyhawk still soldiers on in active service with Brazil, Argentina, Singapore and until this year, Israel. That’s one hell of a record for a combat aircraft. Author XBradTC2Posted on August 28, 2015 Categories planesTags A-4 Skyhawk, plane pron, planes, skyhawk3 Comments on The Skyhawk soldiers on. Critics of the F-35 went bonkers when David Axe posted about one isolated test flight where the F-35 had issues maneuvering against an F-16. Of course, that’s based on an assumption that future air combat will be conducted in a manner similar to the dogfights over North Vietnam in the 1960s and 1970s, where fighters maneuvered hard to get into a narrow cone behind their opponent, and a visual ID was required before engaging. The caterwauling over the lack of a permanently installed gun on the Marine and Navy versions also leans heavily on the assumption that modern air to air missile will work just about as well as their 1960s counterparts. Why would you assume that phones improve, but air to air missile technology doesn’t? And the assumption that future air to air tactics will be like those of Vietnam also ignores (willfully and studiously) the fact that the Navy and the Air Force used the lessons of Vietnam to fundamentally change our entire approach to air to air warfare. Here’s a homework assignment- watch all four of these videos. It’s about 40 minutes. Wigs is one of the most respected fighter pilots to come out of the Tomcat community. And here’s Bio, another highly respected member of the community. When I joined my first F-14 squadron in 1981 (VF-24), the A-model was still relatively new and some US Navy squadrons were still flying Phantoms. The potential threats that we most often trained for were the MiG-17 and MiG-21, which were not match of a threat beyond visual range (BVR), but could be a handful if you got engaged within visual range (WVR). Since we always expected to be outnumbered, and with the lessons from the air war over Vietnam still fresh, we spent a lot of our training fuel and time on ACM – air combat maneuvering, or dogfighting. When we started to get serious about the threat, especially when the AA-10 Alamo arrived, we realized we had to employ AIM-54s against enemy fighters. So of course we began to train with them. I think the capability was in TACTS all along, we just never used it. Fortunately the Navy introduced the AIM-54C in 1987, when we really needed it. The Charlie corrected many shortcomings of the Alpha, in both outer air battle and closer-in tactical environments. With its long motor burn time, large warhead, and radar improvements, the AIM-54C was a tenacious missile. Again, it is too bad it doesn’t have a combat record. One of the coolest visuals I remember was from TACTS debriefs at Fallon, when a division of Tomcats launched AIM-54Cs against simulated Fulcrums at 30-plus miles. A few seconds after launch the debriefer rotated the view from overhead to horizontal, and there were four Phoenixes performing their trajectory-shaping climbs. AIM-54s were not 100% kills, but they sure started to reduce the threat as scenarios developed. Air combat has changed in the 40 years since Vietnam. The single most common tactic in air to air combat today, world wide, is the “in your face” long range Beyond Visual Range radar guided missile shot. That means that the key to success in air to air combat is seeing the other guy before he sees you, and having a weapon that can exploit that sensor advantage. The APG-81 AESA on board the F-35, coupled with off board sensors such as E-3 Sentry or E-2 Hawkeye, will give the F-35 an increased probability of “first look” while the relatively stealthy airframe will delay an opponent the chance to lock up. Am I still critical of the F-35 program? You bet. The decision to give the Marines a supersonic jump jet drove just about every aspect of the design of all three variants, and imposed compromises and costs that have greatly hampered the entire program. But that doesn’t mean the jet is an utter catastrophe. Every fighter program is always criticized. You may not recall this, but the newspapers just about ran out of ink writing articles about what expensive disasters the F-14 and F-15 were. How’d that work out? Shortly after 1440 on 15 September 1942, in the waters of the Solomon Islands, USS Wasp (CV-7) was struck by three torpedoes from the IJN submarine I-19. The impact point was directly below the AVGAS distribution station, which was in operation when the torpedoes struck. Within minutes, Wasp was engulfed in flames, roaring like a furnace, punctuated by powerful explosions from built-up gasoline vapors. Ammunition and aerial bombs began to detonate from the heat, and inside of an hour, Captain Forrest Sherman ordered Wasp abandoned. She burned well into the evening before torpedoes from USS Lansdowne (DD-486) finally sank her. When I was a young lad, I read an excellent book on the Solomons Campaign. In it, the author described Wasp as burning like a torch, and how, as darkness fell, sailors on other ships could see her glowing red from the fires inside. When Wasp finally slipped beneath the waves, it was said she emanated a loud and eerie hissing as her hot steel sank into the sea. Watching the footage above, one understands that such a description, like Tom Lea’s famous painting, is hardly hyperbole. In all, 193 sailors died on Wasp, and 366 were wounded. Forty-three precious aircraft also went down with her. She had been in commission just 28 months. In the 37 weeks of war since December 7th, the US Navy had lost Langley (CV-1), Lexington (CV-2), Yorktown (CV-5), and Wasp (CV-7). Also soon to be lost was Hornet (CV-8), sunk at Santa Cruz on 26 October 1942. Hornet, however, would be the last US fleet carrier lost during the war. One Direction, NASA, Patricia Lynn, and modern all weather attack. You should probably mute this, but play “name that plane” and spot the non-T-38 plane in the video. That’s the WB-57F Canberra, used by NASA for high altitude atmospheric research. It was originally used by the USAF to collect atmospheric samples during nuclear testing. Collecting samples of radioactive particles after a nuclear blast, physicists can tell a great deal about how effective a device was. We collected samples both of our own devices, and those of the Soviet Union, and indeed everyone else’s. The WB-57 was derived from the RB-57, which was something of a poor man’s alternative to the U-2. A basic B-57 bomber was converted with vastly larger wings and upgraded powerplants to give it a much higher operational ceiling. Unfortunately, as the U-2 discovered in May of 1960, the SA-2 Guideline had an even higher ceiling. The basic B-57 itself was built by Martin, being derived from the British English Electric Canberra bomber. The first major variant operational with the USAF, the B-57B, served in Vietnam as a day/night interdiction/strike aircraft, and even flew some strikes against North Vietnam in the early years of the war. Increasing air defenses there meant it was soon withdrawn from use up north, but it soldiered on for a few more years providing air support in South Vietnam, eventually being replaced by newer tactical aircraft. To find targets for those tactical aircraft meant aerial reconnaissance, and a lot of it, particularly against the NVA’s logistical trail, the Ho Chi Mihn Trail. A lot of RF-101 Voodoo and RF-4 Phantom sorties were flown, but results, particularly at night, were less than great. And so Project Patricia Lynn was started. A handful of RB-57Es were deployed to use infra-red cameras locate targets. It was very effective, with some estimates that 80% of the usable aerial reconnaissance came from Patricia Lynn. The adaptability and flexibility of the B-57 also lead to a couple of experiments with using sensors such as Low Light Level Television and infrared line scanners to allow the crew to see targets at night in real time, rather than having to wait for IR film to be developed. That impressive real time capability lead to the ugly, but impressive B-57G. With LLTV, IR and a laser rangefinder/designator built in, the B-57G was the first truly effective precision night attack jet. It was the first jet to have a built in capability to self designate targets for laser guided bombs at night. The cutting edge technology meant they were maintenance nightmares, and had poor availability rates, but when they worked, they showed just how effective night attack sensors and precision guided weapons could be. Switching back to the big wing WB-57 for a bit, let’s talk about networked warfare for a bit. More and more, we rely on datalink networks to provide a picture of the battlefield. But that raises to problems. Not all datalinks are compatible, and most are line of sight only. That lead to the development of BACN, the Battlefield Airborne Communications Node. BACN is both a relay and a translator, allowing various networks to work together. And since line of sight increases with altitude, it was first deployed aboard the WB-57, and operationally used in Afghanistan in 2012. The WB-57s have returned to NASA, and a third has recently been added to the fleet. Not bad for a design the British first flew in 1949. Author XBradTC2Posted on August 21, 2015 Categories Air Force, NASA, planesTags Afghanistan, air force, B-57, nasa, planes1 Comment on One Direction, NASA, Patricia Lynn, and modern all weather attack. The Alenia Aermacchi built C-27J is a modernized version of the Aeritalia G.222 light transport of the 1970s. The US acquisition program for the C-27J was an utter catastrophe, but the fact remains that it is a capable aircraft, and is generating quite a bit of interest in international sales. One thing readers here might have noticed is that transport aircraft are inherently adaptable to other roles, either on a permanent basis, or through the use of palletized mission loads. In alliance with ATK Orbital, Alenia is developing as a private venture the MC-27J, which, while still capable as a tactical airlifter, can also be used to carry Hellfire missiles, and a ATK 30mm chain gun mounted on a roll-on/roll-off pallet. Earlier today, as expected, GEN Dunford declared that VMFA-121 had achieved Initial Operational Capability, essentially the entry of the jet into real service. In a milestone for the F-35 joint strike fighter, the US Marine Corps today declared the F-35B jump-jet model to have achieved initial operational capability (IOC). The news means that the Marines consider the F-35B model – one of three designs of the multi-role fighter — to be an active plane that can perform in operations the same way any other active aircraft in its arsenal can. The plane was declared operational by Gen. Joe Dunford, the outgoing Marine Corps commandant — and incoming Chairman of the Joint Chiefs — in a July 31 announcement. Of course, IOC is a starting point, not an end. Every new platform has a steep learning curve associated with it. All the testing prior to this is conducted by the contractor, and the various test establishments of the services. The Fleet Replacement Squadron, commonly called the RAG, has focused on training aircrew and maintainers to operate the jet, while also beginning to serve as the tactical schoolhouse. But until the squadrons in the fleet actually get out there and start using the jet, it is difficult to really determine how best to operate and maintain it. There will be bad news in the future, and stories of challenges and failures. Guess what? That happens with every single aircraft, vehicle, ship, radio, rifle, you name it. We still maintain that the Marines insistence on STOVL capability has compromised the end product, and certainly driven the cost of the program much higher than it should have been. But we also think the F-35 program as a whole will eventually field a capable attack platform with credible survivability in defended airspace. A couple of days ago, there was severe weather across much of Belgium, the Netherlands, and Luxembourg (Benelux). This played merry hell with the very dense air traffic in northern Europe, with many flights diverted from their destinations. One other knock on effect is that bad weather reduces the operations capacity of an airport. An airport can accommodate half a dozen jet landings in 10 minutes in fair weather might be reduced to only two or three in bad weather. Worse still, bad weather will force missed approaches, further reducing the capacity. This severe weather lead to some very close calls at Amsterdam’s Schiphol International Airport. 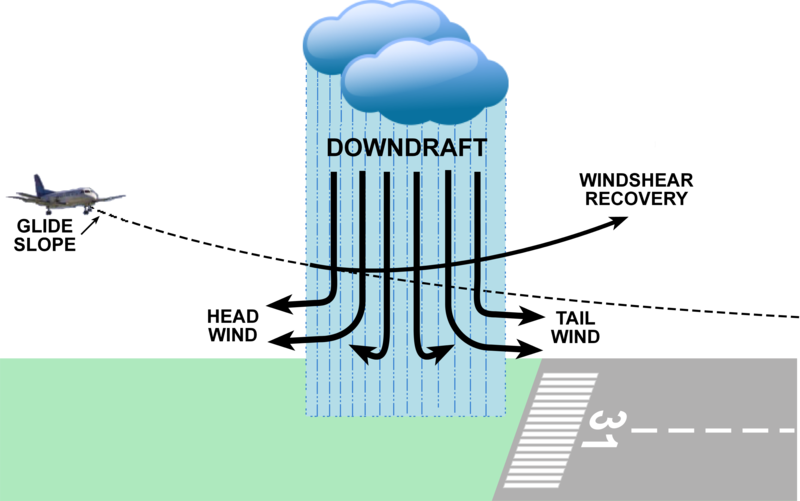 Wind shear is the phenomenon where a column of air is flowing down from a storm toward the ground. When that column of air hits the ground, it flows outward. What happens is that an aircraft on approach, flying into this outward flow essentially suddenly has a major headwind component, and its indicated airspeed makes a sudden leap, say from 140 knots to 160 knots. Pilots on approach, being very sensitive to maintaining speed for landing, almost instinctively reduce power to reduce speed. * The problem is, as the jet passes through the column, while decelerating, they then encounter a very strong downward force, and worse on the far side, they suddenly find themselves traveling in the same direction of the outflow. That effectively removes the headwind component, and indeed, the tailwind component results in a sudden drastic drop in indicated airspeed, say from 160 knots to suddenly 120 knots. The problem is, a 737 won’t fly at 120 knots. Coupled with the downward vector imparted earlier, and the reduction of power, it is very easy for an airliner to be slammed into the ground well short of the runway, with disastrous consequences. I’ll leave it to Spill to describe the proper procedure for pilots that do find themselves in windshear. The atrocious weather at Schiphol meant that Trasnavia wasn’t the only airliner having trouble that day. *Or worse, the autothrottles most airliners fly approaches with do it for the pilot and the pilot doesn’t immediately grasp that they are flying into windshear.